Some of us in the laughter yoga community like to see how much we can do with how little. How much genuine mirth and enjoyment can we induce? How few exercises do we need? How much can we use the group’s / individual’s expertise? How effortless can we make the experience? There is a path in laughter yoga which I and others sometimes walk where we like to be delicate, un-forced, genuine and natural. This is a yoga approach because it focuses on the yogic aim of laughter yoga (union / reconnection / with self & others), and uses laughter yoga principles and exercises as a means of achieving these ends rather than as an end in themselves. This means the role of the laughter exercises is to help access this state of reconnection / being present / union. Those of us who like subtle love this approach. I often observe with this ‘inside out’ approach that people have the experience of laughing lots even if they haven’t laughed their sides off. 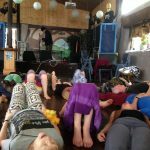 It feels to them that they have laughted their sides off because their laughter has come from a deep inner place – so they have had the double benefit of lots of laughter as well as yogic connection. I was reminded of this today because I had a client who came to me because they said, among other things they wanted to laugh more and have more fun again in their life. I inquired about what was happening in their life and it transpired that they were stressed and anxious, and in particular fed up with being fed up and not enjoying their life. It transpired what they were wanting was empowerment and natural genuine laughter as an expression of enjoyment in their life. They wanted the joy they associated with laughter. I duly took them through a process, part of which was to smile. They said they felt ‘present’. Any astute laughter yoga practitioner would have observed in the session that we used movement (‘motion creates emotion’), deep breathing (obviously) and smiling, in a flowing un-forced way – all of which induced genuine, natural, spontaneous self-induced laughter, and a sense of joyfulness. A further benefit came afterwards. Before or during the session, they lost some jewellry that was extremely important to them. They were temporarily distracted by this until we re-focused. After the session they resumed their slightly frantic hunt – and then they decided to use what we covered in the session, relaxed, smiled, became ‘present’ – and immediatley found it, in front of their nose where it had been all along. Finding jewellry – yet another result for laughter yoga, naturally? 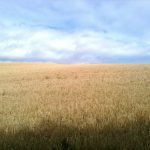 This entry was posted in anxiety, Connection, happiness, laughter yoga and tagged anxiety, connection, happiness, laughter yoga, nls: natural laughter skills, resilience, stress management, wellbeing on October 2, 2017 by Joe Hoare. 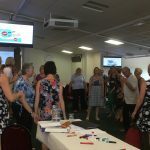 Laughter yoga with fewer exercises and more laughter. 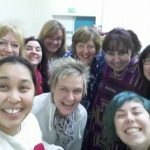 Why do YOU do laughter yoga? And how? Nowadays, I never aim to make people laugh. The funny thing is that because of this, I find they laugh more. The reason for this apparent contradiction, I reckon, is that I ‘begin with the end in mind’, to use Stephen Covey’s Habit 2 from his best-seller ‘7 Habits of Highly Effective People’. For me, the ‘end in mind’ is for people to come alive and to experience union / connection, ie to experience the yogic benefits of laughter yoga. In this approach, the laughter itself is secondary but because it is coming from a strong personal experience of connection, there is lots of it and it is genuine, natural, joyful & spontaneous. The key in this approach is to use laughter yoga as principles rather than as a formula & set of exercises. When we use principles rather than formula, laughter yoga becomes more fluid, more spacious, more spontaneous and also requires less practitioner effort. For participants, it is more finely tuned to their specific requirements, is more natural and genuine, and specifically aims to allow everyone to find their own level. It can also be pitched discreetly as a healing experience. Following from this, it means it can therefore be a richer and more rewarding personal experience, and, according to feedback, more enlivening – because the experience is all coming from the inside out. Essentially, the principles can be reduced to spontaneous ‘playful presence’. As everyone who practises ‘being present’ knows, this is an ever-deepening never-ending journey. Among other things, it requires an unflinching honesty, the shedding of skins and, especially, the willingness to FEEL. If followed courageously, life keeps getting better. Obviously in a short session, all you can do it touch on this, so to achieve this ‘playful presence’, it can be good to be facilitative rather than formulaic, and possibly not use any laughter yoga ‘exercises’ at all. Why use them if you don’t need to? Why use them if the laughter is happening naturally, genuinely and spontaneously anyway? 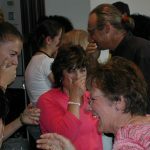 In this approach, laughter yoga is a process and an experience of coming alive and experiencing the joy of being alive – without laughter yoga ‘exercises’ but with masses of laughter. I would love to hear your thoughts & feelings on this. This entry was posted in Connection, Laughing Yogi, Laughter Wellness, laughter yoga and tagged connection, laughing yogi, laughter, laughter meditation, laughter the best medicine, laughter therapy, laughter yoga, mindfulness, nls: natural laughter skills, positive psychology, psycho-neuro-immunology, resilience, stress management, wellbeing on August 22, 2017 by Joe Hoare. Laughter yoga and aromatherapy – is there joy in your hands? I had the pleasure and privilege of giving a talk at the recent IFA conference in London. The theme was Preventative Healthcare, and my topic was ‘Laughter yoga’. The significance of laughter yoga for aromatherapy professionals is its focus on self-care, with potential application for clients. 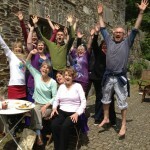 Laughter yoga is often thought of as a group activity, practised outdoors, with laughing-out-loud laughter. There is huge self-care potential in this. However, there are other ways of practising laughter yoga including from the inside out (#laughteryogawithJoe) and this is where it can become directly applicable and useful to aromatherapy practitioners. Laughter can be silent, internal and joyful. Laughter yoga can be practised as an internal discipline with an energetic focus. This means being aware of and focusing on how the laughter yoga impacts mood and wellbeing, and how it can be directed to specific body parts. Which brings us to our hands. With practice, we can develop the ability to experience particular qualities in our hands. For instance, we can both feel and transmit qualities like joy. We ourselves probably all recognise not only the difference of other people’s physical touch, but also the overall ‘feel’ and ‘presence’ of the practitioner. Laughter yoga has the potential to increase the amount of joy we both feel and transmit through our hands. Many of us will be familiar with some form of the Inner Smile meditation practice. We can use this in a physical way too. The easiest way to start exploring this is through the power of your own smile. The key practice is to smile a naturally warm and genuine smile and to feel this smile. Once we have identified this feeling, we then practice moving it around our body, and to our hands. When we focus on feeling the feeling, we invariably start noticing differences – as will our clients. Joy in our hands, everyone? This entry was posted in Laughing Yogi on August 8, 2017 by Joe Hoare. 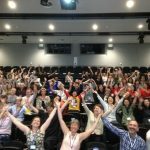 What can laughter yoga do for coaches? Laughing and coaching – ever the twain shall meet? There are many styles of laughter yoga, as there are of coaching. One key practice (which we explored recently at the SWCouncils conference) is a smiling practice. This practice is based on a 1988 pencil-in-the-teeth experiment by Professor Frach and Associates which demonstrated the mood-lifting effects of smiling, and their longevity. As soon as we start examining this, the potential application to coaching practices becomes clear – it is a fast, simple and effective way of shifting mood. Mood-changing, emotional fluidity and resilience are part of an essential coaching toolkit. These specific qualities are developed through laughter yoga practices, especially the solo practices. 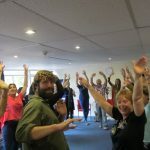 Although laughter yoga is often considered a group activity – which is how it originated – it has evolved to become fluid and user-friendly in all circumstances. Part of the practice becomes learning how to internalise these qualities, and learning to make them work fast and effectively. The Laughter Facilitation Skills course ( #laughteryogawithJoe ) in Bristol, 7/8th October, focuses specifically on this aspect, among others. At a recent (unrelated) training session, one of the delegates was a coach. She spends part of her working time travelling between clients. She had discovered, independently, that by gripping a pencil across her teeth and therefore having her face in the smiling position, she was in the best mood she could be by the time she reached her next client. This is the smiling exercise! With a few additional tweaks, her toolkit expanded significantly, but it was great to come across someone who had figured this basic practice out for themselves. 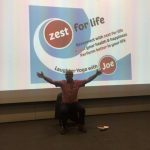 This entry was posted in laughter yoga, psychology, smiling and tagged coaching, connection, laughter yoga, positive psychology, psychology, resilience, smiling, wellbeing on July 20, 2017 by Joe Hoare. We never know how someone will respond to a session and what benefits they will experience. My approach to laughter yoga ( #laughteryogawithJoe ) usually starts with an extended gentle physical loosening up & embodiment session. We do this as a fundamental part of the practice to be enjoyed and savoured, not as an introduction to be hurried through. Sometimes the majority of the session is taken up with loosening, and therefore experiencing the body /mind connection of mind/body ‘medicine’. My original intention behind this approach was to help participants experience relief from over-thinking, and potentially to help establish new neural pathways to trigger movement as an antidote. Freedom from over-thinking is a core stress-buster & mindfulness practice and so helps induce calm and inner peacefulness. Key practice: move your body. Move your body gently. Focus on gentle movement for & with your shoulders. At one such session for the Macmillan charity we did a longer-than-usual gentle loosening up and also a lot of gentle arm-swinging & shoulder-tension release. Afterwards, one person came up to me and told me their shoulder pain had gone. They told me they’d experienced this condition for many years, and yet after 30 minutes of this gentle laughter yoga loosening, the pain had gone. They had visited many specialists over the years, and yet what had released it for them was this very gentle extended loosening-up. She was astonished and delighted. I was delighted and intrigued. I reckoned this must be a happy one-off. Last week at after a similar but shorter session, someone came up to me and told me that their yoga and pilates sessions are generally energetic with a lot of tensing and straining, and they always get a headache. Our session had been gentle and releasing while still being very energetic, and they told me it was the first time they had exercised yogically without getting a headache. Advanced practice: move vigorously but gently, as gently as you can. Even more recently at the International Federation of Aromatherapists’ conference, someone made a point of commenting after the session how relaxed they felt. The following day they reported their neck had stopped being clicky. They, like me, were astonished and delighted. Complete practice (short form): relax, breathe, smile, feel. Evidently, the path to inner peace brings unexpected, important and welcome benefits! Although the ultimate aim of laughter yoga is ‘inner’ & ‘outer’ peace, there are many benefits to be experienced along the way. Relief from pain is an enormous benefit. It automatically releases stress & tension, helps us be more ‘in the moment’ aka mindful, and therefore happier and more at peace. Relax and enjoy. I’d love to hear any experiences you have had. And if you know anyone who might like to read this too, please share it? This entry was posted in anxiety, Connection, happiness, Laughing Yogi, laughter yoga, mindfulness, stress management and tagged connection, depression, happiness, laughter yoga, mindfulness, pain, resilience, stress management on June 28, 2017 by Joe Hoare. 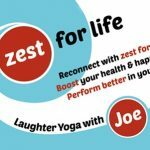 What does this course offer Laughter Yoga leaders? The short answer is it ‘teaches’ laughter yoga from the inside out. What this means is the laughter comes from a deeply experienced inner place – a place of natural, spontaneous, genuine joyfulness. The key practice becomes one of accessing this natural joyfulness, and letting it out, letting it grow, and sharing it. The ‘inside out’ approach works on its own, and as a complement to ‘traditional’ laughter yoga. 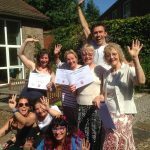 How is this different from other Laughter Yoga courses? The key to this course is it offers principles rather than prescription. This means that it adds to and complements your existing skills. Through this course you find new and unexpected ways of adding to existing exercises, effortlessly creating new ones, and being able to devise new ones on the spot. I’d love to extend these skills to you too. Invariably they bring unexpected and unanticipated benefits – and delight. 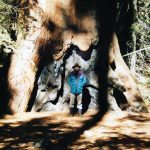 This entry was posted in Laughing Yogi, laughter therapy, Laughter Wellness, laughter yoga and tagged connection, endorphins, Laughing Buddha, laughing yogi, laughter, laughter meditation, laughter the best medicine, laughter therapy, laughter yoga, mindfulness, nls: natural laughter skills, positive psychology, psycho-neuro-immunology, smiling, wellbeing on June 1, 2017 by Joe Hoare. ‘Expect nothing’ means we approach situations open-mindedly and with curiosity. When we are both open-minded and open-hearted, this allows us to be present to what is – and allows magic to happen. On every Retreat we go through a deepening process, of allowing layers to drop away, of stress and anxiety to ease, of allowing healing to happen, and of allowing love to expand – love for self and love for others. In this spirit we grow, heal and connect. 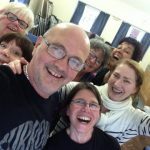 Other people’s words are often best: ‘I had no expectations, I was curious but I came away lighter, freer and enriched by sharing the space with a quite remarkable group of very honest and open individuals. I have struggled for a long time to express my emotions coherently and try to avoid the spotlight whenever possible but this weekend fostered a safe and nurturing environment. ‘To share the light and laughter’ – this is love, and being loving. We can all start practicing this now. This is one quality we might experience on the Retreat . Is this a quality you’d like to experience too? 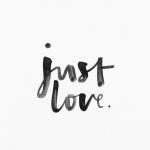 This entry was posted in Connection, happiness, laughter yoga, Love, mindfulness, stress and tagged connection, happiness, laughter meditation, laughter yoga, love, mindfulness, resilience, vulnerability, wellbeing on May 31, 2017 by Joe Hoare. Viktor Frankl, death camps and laughter yoga – what’s the connection? Viktor Frankl discovered a profound place of inner freedom through his prison camp experiences. He discovered his power of choice, his power to choose how to respond to any given set of circumstances. For this reason he became a beacon and inspiration to others, both at the time and subsequently. Yoga is about choice, choosing to undertake practices to promote reconnection, happiness, wellbeing and more. The more advanced we become with our yogic practice (whatever mode of yoga we practise), the more we recognise we need to practise it most at those times we least feel like it – because it is when we least feel like affirming life that we most need to. This is how we develop our personal growth and inner freedom. Laughter yoga is about choice, personal growth and inner freedom. Although laughter yoga is based on laughter practices, when it is pursued more as a yoga practice than a laughing practice, it specifically & consciously develops our inner world. It promotes choice, personal growth and inner freedom. “Between stimulus and response there is a space,”……. 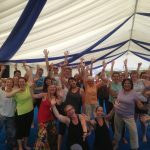 Laughter yoga chooses to fill that space in a life-affirming way. This is what connects the threads in the title. The more you develop your own laughter yoga, the more you use a daily laughter practice, the more diligently you apply yourself to this wellbeing and reconnection discipline, the more you find that you can laugh ‘inside’ as much as ‘outside’. You don’t need to laugh out loud to be practising your laughter yoga. I visited my dentist recently. During my treatment I laughed loudly – on the inside. In this tiny way, I chose to fill my space between stimulus and response (how do you generally ‘respond’ to dental treatment?) with endorphin-releasing life-affirming silent laughter yoga. When we choose to develop our ‘growth and freedom’ we can apply it everyday. At the very least, we can use it as an antidote to the modern epidemics of stress, anxiety, depression, loneliness and more. The more we practise, the more readily its benefits will be available to us should we ever be unfortunate enough to need them in dire and extreme circumstances. As ever, it’s practice, practice, practice. Let’s be wise and not wait till we have a life-threatening situation before we start. Let’s choose to start now? This entry was posted in Action for Happiness, Connection, depression, Laughing Yogi, laughter yoga, stress management and tagged #laughteryogawithJoe, anxiety, connection, depression, endorphins, laughter yoga, mindfulness, resilience, stress management, wellbeing on April 10, 2017 by Joe Hoare. Movement heals – the body can heal the mind. Playful movement can break old patterns. Laughter yoga can break old patterns. 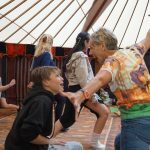 At least once on every course there is a instance where an embodiment, movement, dance and/or physical playfulness exercise ‘breaks’ a mindset and helps someone free themselves from an old pattern. Every time, this exercise is spontaneous, ‘in the moment’, done specifically for that particular person, with the whole group taking part and therefore supporting this liberation process. Magic happens and there are usually tears – tears of relief, of alchemy, of frustration transformed into freedom. In a recent example, someone was terrorised by their rigid high standards. They had to do a presentation and were beating themselves up about it not being ‘good enough’, even though they had been given specific permission to experiment and allow their exercise to flow in its own easy natural way. They were furious and frustrated with themselves – so I got them to start ‘walking’ how they felt. We all joined in. We all trudged along with them (supportively). With minimal encouragement they then started shrugging it off (so we did too). We all ended up gambolling like spring lambs, and the self-rage and frustration had gone. So not only was it helpful for them individually (and therefore for all of us too), but she is going to pass it down the line in her own work. in a ‘first do no harm way’, take risks. In the case above, I had no idea what would happen, I just knew playful movement would help. allow emotion. Don’t be afraid of emotion, just remember to encourage everyone to breathe & relax. This entry was posted in Connection, depression, happiness, Laughing Yogi, laughter yoga, nls: natural laughter skills and tagged anxiety, connection, happiness, laughing yogi, laughter therapy, laughter yoga, nls: natural laughter skills, positive psychology, resilience, stress management, wellbeing on March 23, 2017 by Joe Hoare. I learnt many skills in my previous career as a lumberjack. One that has served me well is listening – not to the hinge cracking, nor the tree falling, but to people. An important part in my lumberjack career was sales and I learnt that if you listen, or rather when we listen, we hear all the person’s under-currents, assumptions, preferences and particularities. This type of listening, when we feel the nuances of the communication, is a great skill to master – if we ever can. Its practical application in laughter yoga is been enormous. It is a subtle skill to feel the nuances in a group – and helpful when we are looking for perfect pitch, so to speak, pitching the ‘perfect’ exercise, ie the perfect exercise for that moment. It is a common practice to have a set, pre-planned repertoire, and it is essential to set the correct intention and to do proper preparation and planning. However, it is important to be able to vary our plan. Sometimes this is forced on us by ‘circumstances’, other times there is a subtle invitation, if we know how to listen. Sometimes someone from the group makes a comment or observation, or behaves or interacts or moves in a particular way that lends itself to becoming a ‘perfect’ exercise. When we turn this moment into a warm, generous and inclusive exercise, it can be perfect. It can certainly be ‘perfect’. The reason it was perfect was because it ‘caught’ the moment, it was spontaneous, inclusive and engaging, it was inviting, playful and fun, everyone found their own enjoyment in it, and everyone found it rewarding. This is my definition of a ‘perfect’ exercise. In my own personal and professional journey I experienced many similar delights. I found the ‘working with what is’ approach in Kindling Point exceptionally useful as it fosters the ability to allow ideas and material to emerge from within the group. Our skill in the laughter yoga / laughter therapy / laughter wellness / laughology / laughter facilitation arena is then to turn this into a ‘perfect’ exercise. When we embrace this, sessions become richer, more rewarding, more effective, more engaging, more life-enhancing. We can all learn this skill. This entry was posted in Connection, Laughing Buddha, Laughing Yogi, laughter, laughter therapy, Laughter Wellness, laughter yoga, mindfulness, nls: natural laughter skills and tagged connection, endorphins, Laughing Buddha, laughing yogi, laughter meditation, laughter the best medicine, laughter therapy, laughter yoga, mindfulness, nls: natural laughter skills, psychology, resilience, wellbeing on March 20, 2017 by Joe Hoare.